Shang Ding is a highly acclaimed oil painter in China and an eminently respected professor of painting there. He is noted in several reference publications in China that cite great Chinese painters since the 1700’s. Today, as he moves comfortably between the U.S. and China, Shang Ding finds his work exhibited in every major museum in China as well as Japan and other countries and museums, galleries and private collections across the U.S.
Shang Ding was fourteen when his parents were arrested and held for three years during China’s Cultural Revolution. This event, during the late 1960s, dramatically changed the life of the budding young artist. Shang Ding grew up as the youngest of six children, his father a journalist and his mother a factory union leader, and remembers becoming intrigued by painting at the age of three. But the imprisonment of his parents fixed Shang with the urgent need to secure his future by dedicating himself to his artistic studies. At seventeen, Shang Ding joined the army working at his paintings by flashlight at night. Eight years of painting under these conditions gave the young artist a deep understanding of ordinary people and their perseverance in the face of hardship and fear. He labored at the frontlines of several battles in southern China while China was at war with North Vietnam – after the U.S. had pulled out. The paintings Shang Ding did of soldiers at war elicited the very best of his talent and his work began receiving awards. In 1974, at an art show in Beijing, the work of Shang Ding was noticed by Mao Zedong’s wife. Greatly impressed that such talent could come from a 20-year-old she drew tremendous attention to his work. Professors from the Central Art Academy were equally impressed, and Shang began his path to fame in China. Shang Ding received a Masters Degree from the Zhejiang Academy of Fine Arts and became an Associate Professor at the Peoples Liberation Army Academy of Art, delivering regular lectures at the Chinese Central Academy of Fine Arts. 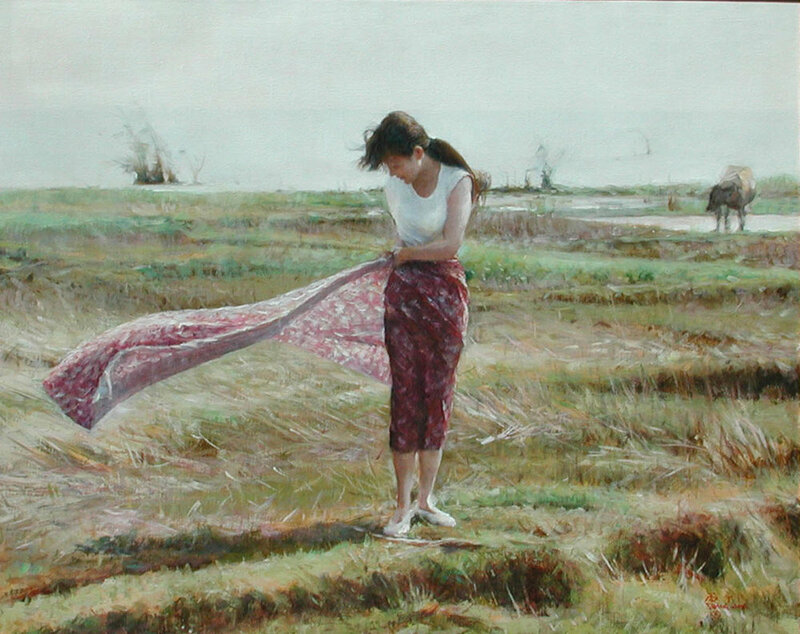 Shang Ding is now a highly acclaimed oil painter in China and an eminently respected professor of painting there. He is noted in several reference publications in China that cite great Chinese painters since the 1700’s. His paintings of the Cultural Revolution and Chinese army life provided these events with exquisitely skilled and rare documentation. In the late 1980s Shang Ding was able to pursue his desire to begin a new art career in the West. As impressed as he is with the United States, adjustments did not always come easy. “Life here is always new and changing; the culture is new and people are not afraid of change.” In China, Shang Ding had stories to tell but his expression was limited; in America, it is his goal to tell an international story that everyone can relate to. Today, as Shang Ding moves comfortably between the U.S. and China, he finds his work exhibited in every major museum in China as well as Japan and other countries. His paintings are currently being collected by museums, galleries and private collections across the U.S.